March has been a busy month for the Tokes team particularly on the development front, as we move closer to a final Release Candidate prior to the 1.0 launch of the Tokes Platform Merchant Gateway. As we have discussed in previous months, our core deployment goals for the Merchant Gateway center around the cannabis vertical within the company’s home state of Nevada, which recently began its 2019 legislative session. Tokes cofounder Dr. Gabriel Allred has been participating in public hearings centered around cannabis banking and blockchain legislation on the docket of the Nevada legislature. This month we will discuss some of the public details of our software development and subsequent deployment strategy. Release candidate 4 of the Merchant Gateway brings us one step closer to a 1.0 release of the point of sale software. The most recent polish includes upgrades to the widget dashboard, various bug fixes, and an updated price querying system for order checkout. Price conversion from US dollars to equivalent value in Tokes (TKS), Bitcoin (BTC) or Litecoin (LTC) — additional fiat currencies can be added easily. Product, product category, and inventory management. While we are pursuing a solution with the state of Nevada to be a vendor for cashless cannabis payments, we are also seeking additional dispensaries to serve as beta partners testing our Merchant Gateway software for customer purchases. This will be coupled with an on site placement of the Vault Logic Smart ATM for consumer acquisition of TKS prior to payment at checkout. The cost for the beta deployment of the software will be free to dispensaries, as we work closely with them to address any potential bugs and optimize the workflows for their specific business needs. While we have some partners queued up for this beta deployment, we are currently fielding additional interest from potential dispensary partners . Dispensaries interested in participating in our closed beta can email support@tokesplatform.org to indicate interest. The Tokes team along with our public affairs representatives have been active within Nevada’s legislative session; meeting with legislators, and giving public testimonies and comments. Multiple legislators and public servants within the state of Nevada have demonstrated strong support of a cashless payment solution for the cannabis industry. This has resulted in several hearings on the matter and a panel created by governor Steve Sisolak to determine the best path forward for cannabis banking within the state of Nevada. Additionally, multiple blockchain bills have been introduced by Senator Ben Kieckhefer, including SB162, SB163, and SB164 which will all positively affect the blockchain ecosystem within our state. The interest in blockchain within Nevada put us in a unique position to work closely with the state on a number of efforts in the coming years deploying solutions for the provenance of all manner of data for government and regulated industries. While we are targeting the cannabis vertical for our first deployments within the state, the products produced by our team are fundamentally industry agnostic. The Tokes team will be back in Nevada’s capital, Carson City, on April 2nd for Blockchain Day at the Nevada legislature. We will have a booth for state legislators to participate in a brief demo of our software solutions for cashless payments and will be discussing the merits of blockchain for more than just digital payments. 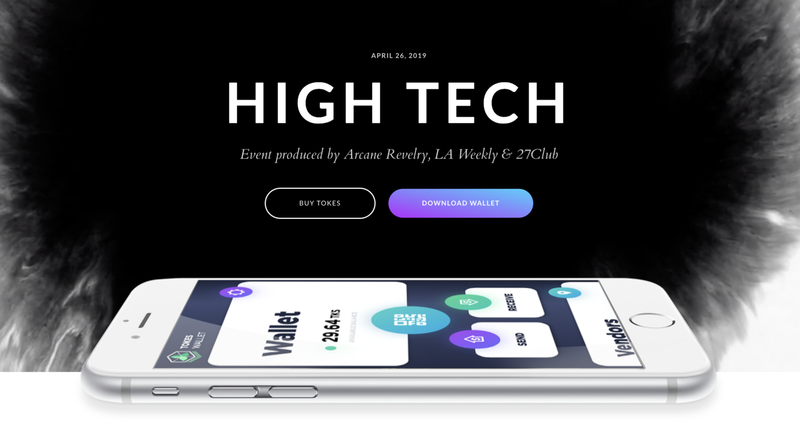 On April 26th Tokes is sponsoring the High Tech cannabis technology event in Downtown Los Angeles, produced in conjunction with the LAWeekly and Arcane Revelry. This event is unique in that we will be integrating Tokes (TKS) into multiple aspects of the event. Sponsors and vendors will download the Tokes Mobile Wallet before entering the venue. Upon arrival, guests will receive a small allocation of TKS to be spent with sponsoring companies and for experiences inside of the venue. Vendors and event staff will utilize the Tokes Merchant Gateway for these purchases. The guests of the event will be comprised of cannabis business stakeholders, influencers, and industry personnel — making this an ideal event for us to demonstrate the ease of use and utility of our software to industry professionals. The event will include live musical acts and entertainment, including Krayzie Bone (of Bone Thugs-N-Harmony), Abdullah Saeed (of Bong Appetit and HBO’s High Maintenance), Yung Zeke & more. In aid of the event we have launched the website Tokes.io primarily focusing on the usage of our mobile application for guests at High Tech and for future promotional events. We will soon announce specific details for this event and encourage those in the Los Angeles area to attend the High Tech event to experience on site activations using TKS. We will announce shortly through our social media how to obtain tickets.